First bite: Wow. Yep, you read, or rather didn’t read, right… This burger doesn’t need a build up, doesn’t need an intro, all it needs, is to be in your mouth. As I smashed my teeth together in the most joyous of ways, instantaneously, the tallegio followed by the gorgonzola blazed glorious trails through my mouth. And just when you thought the excitement would end, oh boy were you wrong. The burger then opened fire with the phenomenal blend of beef and steak, never giving a dull moment. With an array of weapons such as the short rib, hangar steak, brisket, and ground chuck, there’s no escape from the desire to take another bite. But you can’t. Why not? Because that first battle isn’t over quite yet. The properly named, wild rocket arugula, jumped right into the bunkers left by my taste pores, and just as suddenly, filled my mouth with a fresh burst, yet strong flavor of spices and herbs. And just as I had been saying that there was a lack of unique buns in my last post, boy was I pleasantly surprised by the rosemary bun which held everything together and undeniably complimented the wild rocket flavor. The truffle-aioli was the secret agent of the bunch. So decadent, literally disappearing from my mouth only to burst back in with a flavor, only understandable by comparing it to the in-person experience of a .50 cal machine gun. And the House-ketchup. If you remember what I had said in my last post, I wasn’t the biggest fan of “your” basic ketchup on a burger. But this was no ordinary ketchup my friend. Mixed behind the scenes, with the love and care only a momma bear would use to make her honey, the ketchup was… I’m going to say it… The best ketchup I have ever had. In my opinion, this is the ONLY way I ever want to eat ketchup again. More pungent than the boring typical ketchup, with the slightest hint of barbeque, graciously touch your senses. And do I even mention the fries? F yes. Let me tell you, these fries are deep-fried in duck-fat oil. Yep, duck – like the animal – oil. Seasoned with salt and pepper, moderately crispy on the outside yet perfectly soft and delicious on the inside. If you sit down at a table or at the bar in this establishment, you must try these. Whether these delectable fries are dipped in the truffle-aioli sauce or the house-ketchup depends on preference; however, let me tell you, that if you are anything like myself, each sauce was so good that I alternated the entire way through. I have worked at a restaurant before, so I understand when they hit maximum occupancy and have to go on a wait-list in order for new guests to be seated. I also understand that I am 23, standing on the sidewalk in wealthy Corona Del Mar, without a “date” and most definitely not wearing Armani-style clothing. So when I had been told that the wait would be 40-45 minutes, although some would have considered it to be long, I was actually surprised that it wasn’t going to be longer. Yet, an hour and a half later, we were still waiting. This is my only qualm with The Crow Bar and Kitchen. Other than that little hiccup. The experience, atmosphere and service was fantastic. Our server Bradley, was one of the best servers I’ve had wait on me in a long time and it was good to know that The Crow Bar and Kitchen dedicated time and effort into getting all their food products from local organic farms. The Crow Burger alone, was a surprisingly tiny amount at $8.50 while the Duck-Fat Fries were an additional $5.00. So total meal, without drink, came to $13.50. 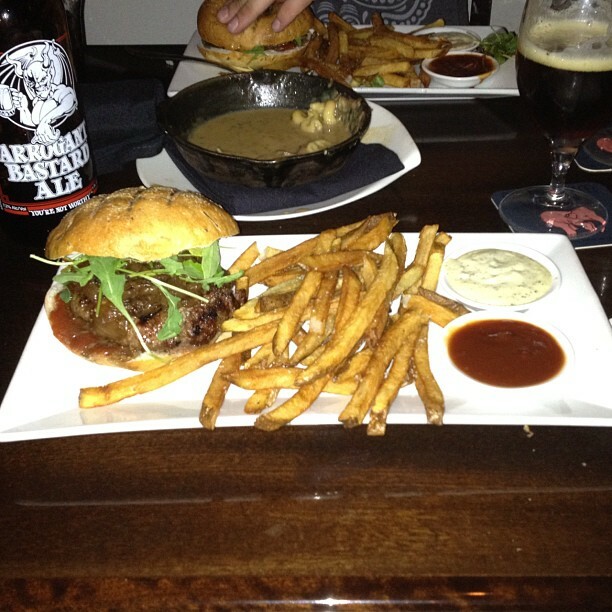 On par with the insufficient Umami Burger, yet money MUCH BETTER spent. Thus, for a ground-breaking and record-shattering burger, The Crow Burger finds itself at #3 on THE Burger List, in between #2 The Counter and #4 Hodad’s. What’s the deal with that soup? The soup was a macaroni, steak, and cheese mixture. My friend had gotten it as an appetizer before the meal and it was honestly to die for. The 3 or 4 (can’t remember) different types of cheeses used were perfectly in-sync with each other.